I just wanted to say thank you for all your energy spent on the faceless masses (and me specifically). Your papers have opened my mind to a lot of new ideas (many of which resonate) and outlooks on this reality. I truly appreciate you. Thanks. It's nice to know somebody actually reads my papers! What most socially-unacceptable researchers (uncommitted investigators) run up against is that it's not difficult to TELL the truth... but it is virtually impossible to be believed! Ran into that with my "wizard" research. I'M even having a difficult time believing the the things I've uncovered, but the evidence is there... right in front of your eyes, but people just cannot SEE it. They've been blinded by social programming. I guess that explains why the old alchemists referred to the uneducated man (muggles) as caecus... Latin for a blind person. But I will tell you this... David Icke got a LOT of it right in the years he's been presenting strange stuff that no one would believe. Not ALL correct, but pretty dang close. And he IS right that if you follow the "reigns of power" up the chain you eventually end up at the Royal houses (Rothchilds, Dragon Family, English monarchy, etc)--but THEY are also "following orders." Yet, you cannot find ANY evidence, anywhere, on WHO is actually pulling the strings of the Royalty. There is some kind of invisible wall there. Makes me wonder who (or what) is actually pulling the strings. And if you want some "unbelievable," how about if I showed you that old sorcerers, you know, the guys that conjure up demons to do their evil bidding, are actually REAL--and so are the demons they conjure? Starts with Chemmies then follows the trail. One mans opinion. Are we talking about a few remaining Rephaim (descendants of the Nephilim of old) who survived the Flood (a la Tolkien's Balrogs or Djinns) or other beings (Elementals?) that populate the Cosmic sector? Considering the "reigns of power" and the ladder towards the "shot callers" leads me to the idea that no matter who or what is in "control" there will always be a higher "shot caller" until there is a singular, ultimate playmaster. There is an interesting argument in the ancient, Christian religions that proposes there CAN be a single Godhead and a hierarchy of angels, because that aspect represents perfect order. The demonic realm, however, is based in chaos and as such, CANNOT have a single leader because that would represent an ordered system, which turns demons into angels. This throws an interesting monkey wrench in the works because, given the highly ordered structure of the New World ORDER, it would indicate that all the bad stuff they are doing to the people of this world are done under the dictates of God and his dominion--not demonic "bad guys." Sumerian records indicate that Jehovah is ENLIL--the military general of the ANNUNA that overthrew the other "gods" to take control for himself as the "one, true God." ENKI accused his brother ENLIL of that before AN (their father) and became known as the Satan... the accuser. Of course, ENKI wasn't the one to start a military coup--the Hebrew's god did that. It is just like the confusion over Noah and the Ark... modern religious texts say that God told Noah to build the Ark, but in all the older Apocrypha, it was the devil that told Noah--because God was planning to wipe out both man and the Nephilim, completely, with the Deluge and he wanted to save mankind (and annoy God by doing so). So if one believes in a mental universe that is created in and occupied by the solo believer, isn't the individual the one really in control? Only if one believes the premise of being in a mental universe. In my studies of the Reciprocal System, it would indicate that the mental universe is a projection of an external universe and as such, mimics it--but not 100%, as a projection always includes dimensional reduction (a shadow does not possess the 3D geometry of the object casting it). You might want to take a look at Manly P. Hall's work regarding the Macroprosophus and Microprosophus, the external and internal worlds of man, respectively. Contrast Nature with the artificial realities created by man. And by "artificial reality," I don't mean a computer simulation, but all the building and construction that mankind does to alter the environment to suit his personal requirements--in complete defiance of the balancing principles of Nature. Nature, when left to itself, "finds a way" to keep things in balance, with a slow, steady evolution of consciousness. Man, on the other hand, throws everything into chaos... again, suggesting a curious inference that it is mankind that is demonic, and the treacherous New World Order is the angelic! Interesting the way these things work out, isn't it? This thought leads me to my unfinished theory that freewill and fate are not mutually exclusive, but that is a topic for another time. In my experience, they are not exclusive but reciprocals. "Fate" is the nonlocal form of "free will." If "free will" were a magnet, "fate" would be the magnetic field. Just copy and paste the "quote" commands around the block of text you want to quote. I've watched that before. There may already be a discussion on this forum about it, regarding black goo. Interesting concept. That was one of the first things that occurred to me, because the Rephaim--like man--survived the Deluge, so where did they go? They were more suited to this environment than mankind was and we survived and prospered. It's been centuries since we've seen giants walking about. But the problem there was that the Rephaim, as described in literature, were a lot like Harry Potter's mountain trolls--dumber than mud. They were disorganized and very rivalrous, so it seems unlikely that they would be able to pull off world control. After the ancient gods were defeated, the bureaucracy of man was left hanging... lots of minions but no one to hand out their orders. The structure that was in place then is now called "The Powers That Be," the royal houses. And man is a natural slave--that is what he was engineered to be, regardless of all this free will stuff. Look at virtually EVERY video game--where you are going on "quests" to appease someone and do their bidding for points. Still a slave running errands for a master. Man will always FIND a master... and I think that happened, back in Tudor dynasty of the 17th century, triggering the industrial age and a new master's plan for humanity. I don't agree here. I think mankind is part of nature. Therefore all of his 'artificial' constructs are natural and a normal progression of an 'intelligent' species. I think mankind is part of nature. Therefore all of his 'artificial' constructs are natural and a normal progression of an 'intelligent' species. I thought like that once as in everything artificial things were natural since they came from natural precursors, such as synthetic fibers etc. made by man for his benefits. Now however I dont see it like that anymore. All of these synthetic materials all around us are progression only in material side, but not in spiritual one. There should be balance somewhere there, but it seems for many that there isn't. Then there is the thing with bioenergy and it being absorbed/insulated by synthetic (unliving, plastic etc.) materials. If you compare the behavior of man with all the other life forms on this planet, the closest match to the behavior mankind is a virus. It infects an area and converts all the cells to reproduce itself, so it can continue to spread until the organism dies. That is what mankind is doing to Earth with chemtrails, bioengineering, EM radiation (Wi-Fry), filling the oceans with garbage, cutting down all the trees... the list just goes on and on. 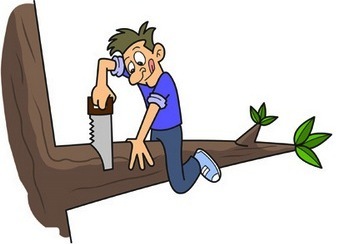 Mankind is like that guy cutting off the branch he is sitting on--is that "intelligent" behavior? Artificial: created from the artifacts OF Nature. I have yet to see a skyscraper grow out of the ground like a tree. According to legend, mankind is not even "natural," being a genetically-engineered creature of the ANNUNA. He is made of the stuff of Nature, but Nature did not produce him as a "natural consequence" of evolution. This is probably why man's spiritual side has not evolved along with his technology. If Nature had produced man, then we'd see science, spirituality and ethics evolving simultaneously. I'd say that man probably has a lot less impact on the environment than you think. A lot of the hysteria of 'the sky is falling' due to man's impact on the environment came out of the global cooling then global warming then climate change crowd that is just trying to impose more control over the masses. If Earth is a sentient being and things got too far out of balance due to man's activities I'm sure she could shake off man like some fleas on a dogs back with a few natural disasters. I'd then posit that designer beings such as man may be a natural consequence of a species reaching a certain level of technology and understanding of how to manipulate DNA. I'm sure tinkering with DNA has to be a common occurrence throughout the universe.